A German father and son have been rescued by the US Air Force after their boat caught fire about 500 miles (800 kilometers) off the coast of Florida. One of the men is believed to have sustained serious burns. Around 80 US airmen took part in a concerted effort in the early hours of Saturday morning to rescue two German nationals stranded hundreds of miles off the coast of Florida in the Atlantic Ocean. The German father and son were rescued from their burning sailing ship after a nearby freighter happened to pass by. An Air Force HC-130 aircraft arrived about two hours later, with five rescue men plunging into the ocean to hoist the German nationals onto the rescue boat and then onto a freighter ship. A handful of other rescue airmen also descended into the water to retrieve medical supplies that had been dropped from the plane. "We had the life boat in the water and the freighter was about two miles away," Captain Dan Morgese, aircraft commander, said in a statement. "Anytime you are putting someone out over the Atlantic, it's concerning. We train for this, it all worked out just fine. If there was day to do it, it was today; the weather was perfect." The German nationals, whose names and hometown were not immediately released, were then treated on the freighter ship before being hoisted onto two Pave Hawk helicopters and flown to an Orlando hospital. The son, aged 48, suffered severe burns on his legs. The two helicopters were accompanied by another HC-130 plane, this time used to refuel the two helicopters in mid-air. "The rescue was a culmination of skill and teamwork," said Col. Kurt Matthews, Commander of the 920th RQW. "Crew Dragon," the new space capsule built by private firm SpaceX, has splashed down successfully in the Atlantic Ocean. The capsule is designed to transport astronauts to the ISS. 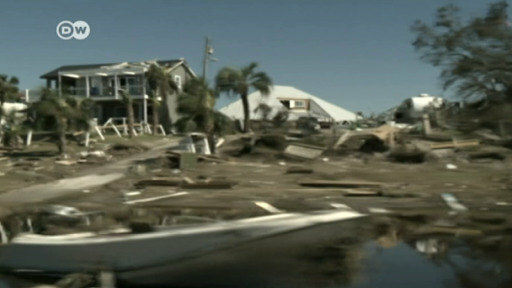 Search and rescue teams from all corners of Florida have begun going from house to house. The scale of destruction they encounter on the streets of communities like St. Joe’s is enormous. Most homes are destroyed or severely damaged. Florida families emerged from shelters to find their neighborhoods leveled after the strongest storm since 1969 wreaked havoc. More than 375,000 people were issued mandatory evacuation orders, but many defied the calls.